A few weeks ago, our school held a Daddy-daughter dance, an event for which I wrestled two little girls into red velour dresses with sparkle sashes, then wrestled their father into a clean, ironed shirt. And then I tagged along, because the dance was held in the school activity center, and the (this is way too much TMI) seats in the ladies’ room there are such that my tiny-heinied snowflakes can’t use them without a spotter. So yes, I crashed the daddy/daughter event, paying $10 for the privilege of taking my kids to the bathroom all evening. There should be some country music lyrics for that. At the dance was a raffle table, mostly filled with the kind of sparkly crap that little girls love. My husband bought the girls tickets, and let them choose what items they wanted to place their tickets on, which I thought unbearably sweet, because they were choosing things like ‘porcelain unicorn’ and ‘world’s largest (glass paperweight) DIAMOND!’ but passing up the few Dad-friendly raffle items, like major-league baseball tickets, a grill set, and fancy BBQ rubs. I commented to the mom running the raffle table about what he was doing, and how he wouldn’t enter anything for himself, and then I bought a few tickets in his name from her, and dropped them in the major-league baseball raffle drawing. I wouldn’t dare suggest that the fix was in for Daddy Charming, but he did indeed win the major league baseball game tickets. He was pretty excited, in his usual “I show no emotion,” Ron Swanson sort of way, and immediately offered to take me as his ‘plus one’, but in a fit of Awesome Wifeness, I told him he should take a guy friend, make a day of it, have some horrible stadium food, watch our team lose, and just man it up for an afternoon, sans famille. Take a little vacation from family life and overpay for beer. Which he did yesterday, and judging by the ridiculous texts and photos they sent me, was a good time. I don’t like to call myself a hero, but … there was an awesome mani/pedi gift card on that table, too, and I really need a pedicure, stat, yet I did not use any of my raffle tickets on prizes that might meet my own needs. I don’t want to be one of those bloggers that complains about the weather, but it snowed here on Saturday, and you can’t get a pedicure if you have to stuff your freshly-painted feet into a pair of snowboots afterwards. A winter of Sorrells, and my feet are feeling a little hoof-like. I need help! Isn’t that the prettiest colour over there? 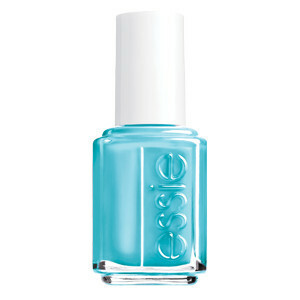 In The Cabana, by Essie. I am just craving a good pedicure, topped off with this gorgeous blue. Blue! The entirety of my midlife crisis is catalogued by the ridiculous colours I started to wear on my toenails last year. Last year, I was all black, black, black, but right now, I just want this summery colour on my feet. And I don’t feel guilty at all about booking a pedicure this week. After all, my husband spent a whole day at a major sporting event. Without me! So he owes me one.